Let's find ways to make school and learning easier for your family! Education advocacy and coaching is all about building deep personal connections, creating trusting relationships in order to find school success on your own terms. Our services look different for every single family because each of you have unique goals and needs. Let’s map out what working with Meg might look like for your family! Contact Meg for a FREE Consult! Standing up for yourself is challenging, especially when you don’t quite know all the rules. Working with a professional educator who understands how IEPs, 504 Plans, and Gifted Education works just makes sense. You’ll feel confident asking for services, support, and solutions when you work with Meg. It’s hard to find the right path when you don’t have a map. Coaching gives families the best guide to learning success. Whether you need to reset your homework routine or figure out your best homeschooling life, Meg’s expert advice can help you find the way forward, together. I can’t say enough about Meg!! We moved in late Jan and our daughter was having some issues in school. A fellow friend told me about Meg and I immediately contacted her. She has helped us SO much. My daughter is on grade level for reading and has improved greatly in math. All around just her enjoyment of school has improved. 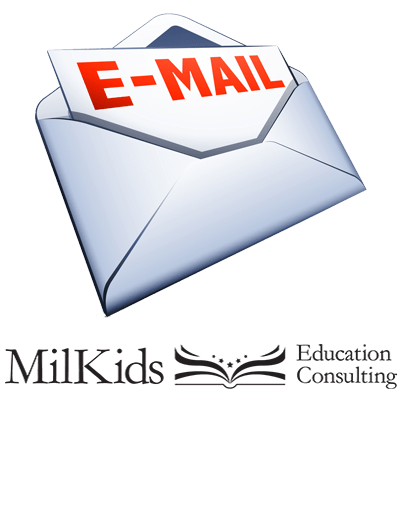 MilKids Consulting has a clear understanding of the needs of the vulnerable children in this population. Level headed, clear objectives and easily understood are hallmarks of work provided. From the mother of multiple children with special needs. Open to promoting valued resources for all children. I can list so many great things about working with Meg to get my son a 504 at school. She made the process quick and easy. She’s not scared to hold the school accountable and call them out when it’s needed. Most importantly she treats our kids like she would her own. Her passion is beyond apparent for the kids she works so hard for. We have one mission: to help families find success and solutions to learning that work. Whether that’s through advocacy at school or coaching at home, a job isn’t finished until you are satisfied.